Lectures and workshop for African Folklore Embroidery, appliqué the African Folklore Embroidery way and beading with African Folklore Embroidery are offered throughout the United States. Please check our schedule on a regular basis as new classes, lectures & workshops are added each month. The only item you need to bring with to an African Folklore Embroidery workshop is a pair of scissors. OF THREADS - OVER 200 COLORS! Fusing creative worlds - African Folklore Embroidery meets artist, David Labkovski. 10:00am Temecula Community Recreation Center 30875 Rancho Vista Rd, Temecula. This out-of-the box creative class; breaks rules, boundaries and borders. No experience is necessary as we explore the creative world of tribal arts and customs. You will learn stitching, beading and embellishment techniques to complete an African Folklore Embroidery design. Already completed an African Folklore Embroidery Class? Come and learn new stitches, techniques and completion ideas! 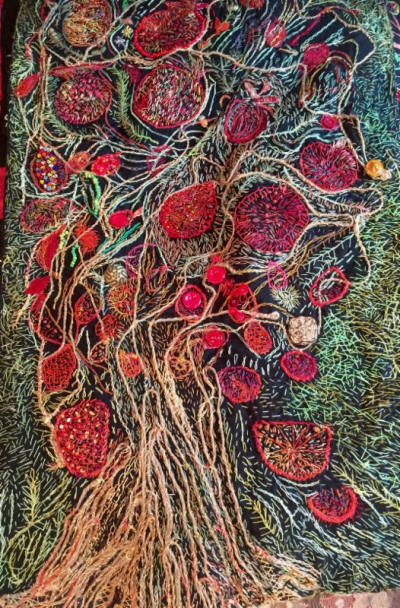 African Folklore Embroidery art exhibit by fiber and thread artist Leora Raikin at the Zena and Pauline Gatov Gallery - Alpert Long Beach Jewish Community Center. Free and open to public. We carry a very large selection of hand-dyed, variegated embroidery thread in Pearl 5, Pearl 8, 6-stranded Floss, Silk Thread and Silk Ribbon in 3 sizes. Visit our store and select from 100's of different colors.